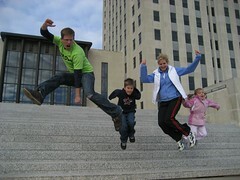 Lisa brought her two young kids Josh and Karsen to meet us at the capitol building in Bismarck. Josh (9) and Karsen (6) seemed a little shy at first, then we asked if they wanted to do some jump shots and they broke out of their shells. After walking around the capitol building area we realized it was cold, so we headed to Lisa’s place. We made a pit stop at the Lewis and Clark monument in town along the way to her suburban home. The plan was to wait an hour or so until her husband Jeff got off work, then pack up the family and head south for the night. Jeff got delayed at work, he even got to hold the Fed-Ex plane, so we got a chance to play street hockey. Lisa set us up with some pizza, video games and driveway sports. Jeff was home and we were ready to go. The six of us, and their dog Gizmo packed into the Honda Pilot and headed to South Dakota. 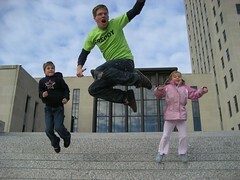 Lisa, Mark, Josh and Karsen are such an awesome family. Going on the little family road trip with them is easily one of the highlights from the trip so far. Their hospitality and generosity made it feel like we were part of the family, not just some guests for the day. The kids are hilarious too. Karsen told us how she doesn’t like McDonalds because they put owls, eagles and hawks into the nuggets. Then about five minutes later she’s calls out from the back seat “I want McDonalds for supper”. Josh got our attention when he told his mom that he wants to go hitchhike around America. We assured him it’s not a good idea and to wait until he’s much older. Then we called ourselves a lawyer. The drive was fun and included all the typical driving with kids events. “Are we there yet” began about 20 minutes into the three hour drive and continued until arriving in Pierre. When the kids weren’t glued into their DVD players it was non-stop games of telling jokes, bugging mom and dad, asking questions and taking photos. In other words it was a lot of fun. We got to Pierre around 10PM, but held off on capitol photos until the morning. The six of us split into two hotel rooms, but hung out for a couple more hours. Josh and Karsen got some ice cream for a late-night snack, so they served as the entertainment. 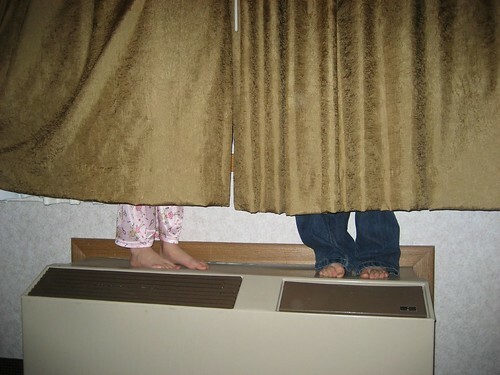 We even had a game of hotel room hide and seek. We now know a new recipe for entertainment and fun: Start with a late night, mix in some kids, add two servings of ice cream, wait 10 minutes for results and enjoy. Housekeeping got turned away a couple times this morning as we caught up on some sleep. When we were caught up it was time to meet Judy and head south. Judy is a mother of three and grandmother of four. Her son Chris follows our progress, when he saw we made it to Minot he called his mom from Fargo and asked her to give us a ride. It worked with her schedule and we were set. One of her granddaughters was going to come, but it didn’t work out. She even had the day off school for hunting season. You see hunting season opens at noon on Friday in North Dakota, so the kids in Minot get the day off school. Neither of us had tried Walleye before, lucky for us we were in Walleye country. 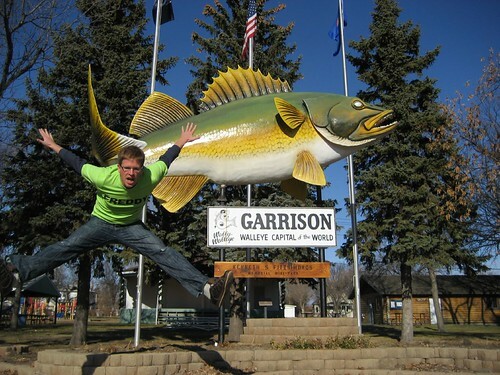 In fact, only a few miles from Minot rests the world’s biggest Walleye in Garrison, ND. We went there, admired its grandeur and beauty, then got some photos. Then we went to get some lunch just down the steet. To make a potentially good story into a lame story, we didn’t order Walleye. We ordered burgers. Lucky for us Judy invited us back to Minot for a big Walleye cookout in the summer. Judy continued to drive us towards Bismarck. We talked about she's planning to start a wedding planning business with one of her friends in Minot. So if you’re getting married anytime soon around Minot, look her up. 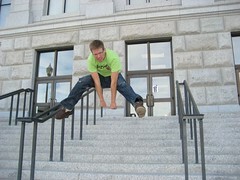 We arrived at the capitol building in the mid-afternoon, had a look around and got some photos before parting ways. After saying bye to Judy we needed to find a way south to Pierre. We knew Thursday was destined to be good as soon as we woke. It was 6:30AM, the radio came alive with Ronnie James Dio’s “Rainbow in the dark”. Never heard of it? Download it now, you won’t regret it. This epic rock ballad combined with our ride to Shelby got us up and out the door before the sun rose. Greg and his brother Kevin, who decided to come along for the trip picked us up and we headed off. They took us to a local breakfast café and a quick tour around town then we were off to Shelby. Kevin and Greg are two easy going brothers who took the day off work to help us out. 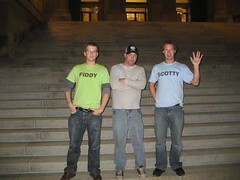 They both work in the IT industry in Helena and both have good stories about bagging on the Saturn we were driving. 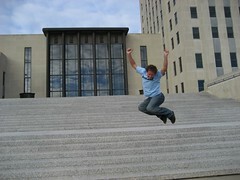 Like jumping it over rail road tracks. The mountains and canyons around Helena are pretty impressive. You drive right towards a cliff face, then a small canyon appears and winds through towering cliffs. There’s a river on one side, steaming in the early morning sun, with several fly fishermen dotted throughout its banks. It was described to us as “celebrity ranch territory”. That was cool, but not as cool as the milk energy drink Kevin bought. We arrived in Shelby, which is not much more than a train station and sorted out the tickets. A big thanks again for Nick and everyone at Leisure Travel Inc. in Minneapolis for setting up the tickets. The train ride was…well it was comfy and easy. But that’s about it. The flat, desolate landscapes of the Montana badlands gave way to darkness and the darkness gave way to boredom. We were pretty far from "The Islands". 1.“Oh man, compare this train to the Greyhound, no contest. I’ll take the train any day over that looser cruiser”. 3.“You know, when they refurbished these trains, you’d think they would’ve put some power outlets in them”. 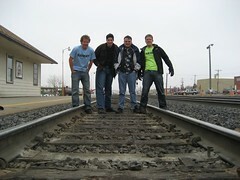 We arrived in Minot around 9:30 and went to find somewhere to stay. We thought our day was coming to an uneventful day when the phone rang. It was a guy named Brandon, who came by to drop off a present. Here’s Brandon and his present: Hamm’s. Hamm’s is our favorite beer, because it’s “Born in the land of sky blue waters”. 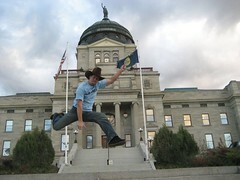 After the Montana capitol building we walked a mile or two down to the highway to head north to Shelby. Well that was the plan anyways. We found a busy onramp and parked ourselves, thinking it wouldn’t take long to find a ride. First off some phone and contact info details. Nextel kinda forgot about Montana, Wyoming and most of the Dakotas. So our phone doesn’t have service today and maybe not tomorrow. We can still check the messages though, but email is the best way to contact us. It’s also wreaking havoc on the GPS tracking so please be patient for the next day or two, we're working to get it going. Thanks. Slow going on the Montana highways today. Kept it grassroots the whole day, but our first ride didn't come until about noon in Bozeman and took us all they way to Belgrade, 10 miles away. Another half hour on the side of the highway, then a two-tone brown van pulled over. We crammed ourselves in with Arianna, Leprechaun and their son Rowan. That’s right Leprechaun. They are a friendly group who belong to the Rainbow Family organization. Along the ride we learned a little about numerology from them. Calculated from our birthdates Freddy and I are both 8’s, while Arianna and Leprechaun are collectively a 7. Here’s where it gets interesting: Add both our 8’s together and you get 16, now add the 1+6 and you get 7! So both groups are both collectively 7’s. Not really sold on what this means, but they were pretty excited about it. Leprechaun talked passionately about mind over body, spirit over mind, body over mind type theories and ideas. Like two stone statues we sat in the back of the van trying to take it all in. I don’t really get it all, but it seemed positive, so that’s cool. Half an hour later they dropped us off on the side of the road with the challenge to take two cookie jars, fill them with cookies then write love on one and hate on the other. Over the following two weeks focus on each jar thinking thoughts of love and hate for the appropriate ones. Apparently after two weeks the ‘hate cookies’ will be rotten and the ‘love cookies’ will be fresh. Interesting. Someone try it out and let us know on your findings. After parting ways with our Rainbow Family friends we waited a couple hours more for a ride to Helena. A few dozen rabbits kept us company on the side of the highway, so that was fun, so much fun. Finally Drew picked us up and took us the 65 miles into Helena. Drew is a nice local guy back from military service and finishing business school. He took us into town and dropped us at the local shopping mall. Luckily the capitol building was only a couple blocks away. 34 done. Before we tell you about Niki you should check out her web site for yourself. Just click here. She even wrote about hangin' out with us in Utah. After meeting up at the capitol building Niki took us on a quick tour of Salt Lake City and to Café Rio before heading back up the same road we just came down. Like Jack, Niki works full-time at a good job, and has a dream to be in the entertainment industry. The difference is, Niki is a rocket scientist. She works in the engineering department at a local NASA facility. We found it to be a pretty interesting contrast from riding with a trucker to a rocket scientist. But when we got talking to her, she was so down to earth, just like Jack. She wants to be an actress and work in the film industry, just like Jack. Pretty cool how two people from two very different lives both want the same thing. Niki is chasing her dream of acting through doing local jobs and film shoots. She’s gonna be working with Allan Wills from www.areyoumywife.com in the coming few weeks too. 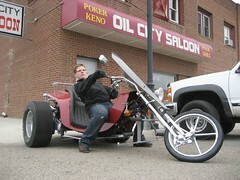 Check out Allan and Niki’s web sits for details as they come. We had a good time chatting and seeing the sights of the Utah and Idaho countryside from her car, unfortunately the ride was a short one because Niki had a film shoot in the evening and had to get back to Salt Lake City. That’s okay it looks like we’ll see her again in Nevada in a couple weeks. Hope so anyways. We said goodbye to Niki in Pocatello, Idaho and tried our luck at the highway on ramp. After 20 minutes a Jeep pulled up to the adjacent intersection and we heard a voice yelling at us to get in. Without thinking we jumped in as the Jeep was already moving. 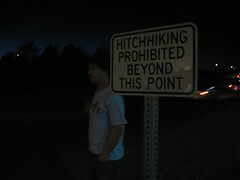 Mike and Bronson saw us on the side of the on ramp earlier and decided to come get us. They are two local high school grads going to see their friends at college in Bozeman, Montana. What a sweet score, that’s like 250 miles away. Plus Mike’s Jeep had a massive stereo and a DVD player. We cruised in style watching ski videos and movies through Yellowstone National Park into Montana and onto Bozeman. 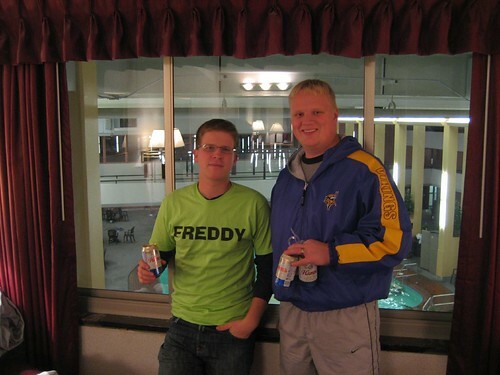 At Montana State University we met up with their friends and stayed in John Michael’s room. Got the full first year dorm experience. Way too many people packed into a small room huddled around an Xbox and a smuggled stash of beer. The beds are modified using a few 2X4’s to create enough room for a futon and a make-shift kitchen including a mini-fridge, microwave and a toaster oven. I didn’t see it, but I’m sure a George Foreman grill was somewhere around. 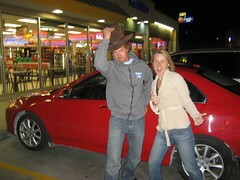 After a late night, and a crowded sleep in a stuffy room we were back on the highway headed to Helena. Jack’s driving hours are limited by federal laws, so we pulled into a truck stop in northern Utah for the night. 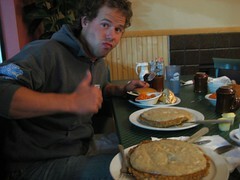 After a cheap motel sleep we continued our trucker lifestyle with a gas station breakfast and headed to Salt Lake City. Jack had to smuggle us through certain parts of the highway, like scales and when other company trucks were around. We felt like illegal aliens, shoved in the sleeper cabin of Jack’s truck, not being able to see what was going on or where we were. That’s okay because we made it to Salt Lake City in good time. Jack is an interesting guy. Not your stereotypical trucker. He owns a production company and is trying to make a documentary on the trucking lifestyle. He heard us on a NPR radio station in Portland, Oregon on Sunday night and liked the idea of our story. To his surprise he spotted us on the side of the road Monday afternoon. Jack has some good ideas to make the documentary a success. He's planning on doing a combination of pre-arranged rides and hitchhiked rides with truckers all over the country and getting their stories on film, sounds like an interesting idea to me. We talked more about setting up a blog or website for Jack. He has so many cool stories from the road and sees such amazing places everyday. Jack you got an audience waiting to hear your stories and see your sights, make it happen. Jack’s truck was too big for the roads around Utah’s capital building, so his friend Roger picked us up and drove us to the capitol building. Niki met us there too. We decided it would be fun to vote, so we went inside to ‘have our voice heard’. It turns out nobody wanted to listen, so they sent us off without letting us vote. Not even Niki, a Salt Lake resident. We got some cool stickers though. 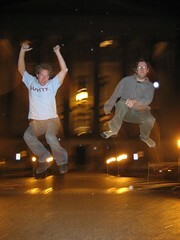 And some even cooler jump shots. After saying bye to Jack and Roger we got in Niki’s sweet new Acura and headed back north towards Montana. 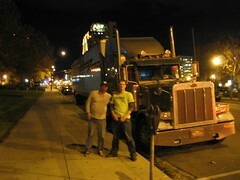 The particular Peterbilt we are riding in is pretty much the Cadillac of semi trucks. It has two separate sleeping bunks, cushy suspension and seats that are fit for a King. Tonight we ride in style. If you're going to be riding like a trucker, you need to eat like one too. So the three of us pulled off at the Truck Corral in Baker City, OR for some authentic cuisine. 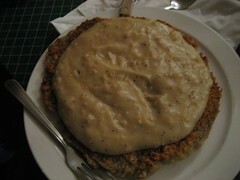 They specialize in Chicken Fried Steaks...the size of hubcaps. 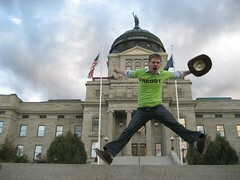 After that onslaught we were on our way to state capitol number 32: Boise, ID. We were a little concerned about how exactly we would be getting our obligatory capitol- building photos while riding in a 18 wheeler on the interstate. Jack said he could make it happen. As long as you don't mind paying for four parking meters at once, apparently you can park a semi truck at the capitol building. Onwards to Salt Lake City! Before we started Hitch50 we figured rigs or long-haul trucks would be the 'bread and butter' of our rides. But this never happened, we didn't have a single ride in a rig, or any commercial truck. Until today. After waiting several hours on the side of I84 we climbed aboard Jack's truck in The Dalles, Oregon and headed east. He's hauling empty beer kegs to Salt Lake City, Utah. Jack is also planning to make a documentary about trucking and the lifestyle on the road. So hopefully we can get some good footage for him. On the open road, through Boise to SLC. Before we begin, congratulations to ultra-endurance runner Dean Karnazes. Yesterday he completed his goal of running a marathon in all 50 states in 50 consecutive days. Very, very impressive. Check out his website here. 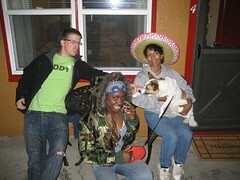 After Salem, Debbie took us out for some pizza, then passed us off to Julia and her dog Nora. Randomly, Debbie and Julia live just blocks away from each other in Portland, making the hand-off very convenient. We picked up Julia’s niece Jolie and headed east out of Portland. 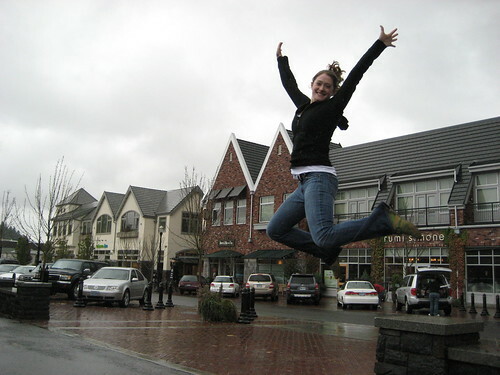 Julia is an Oregon local, mother, wife and business owner. Her niece Jolie is originally from Gabon in west-central Africa. She’s been in America for six years, and has a promising basketball career. The doggy, Nora is a Norrbottenspets, a rare type of dog from Sweden. In a Korean car our international group set off in the rain to “The Gorge”. Along the way Julia told us one of the most amazing stories ever. Julia was born blind, and remained blind until the age of 22. At this time she had surgery, attempting to give her sight. A couple days later Julia removed her bandages and saw the world for the first time. Not only did she see the world for the first time, she also saw her two year old son for the first time. It’s hard to even begin to imagine what this feeling would be like. 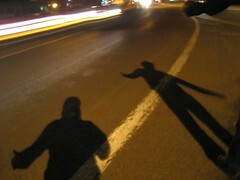 She then joked about how we are trusting her to drive us in the dark and rain, even though she was once blind. The friendly girls drove us to Hood River; the area is also known as “The Gorge”. We got a couple photos with them, said goodbye and found a place to sleep. Idaho is on the to do list for tomorrow. Maybe even Utah if we score some good, long, fast rides. But for now we don't have any rides, and it's really wet out. If anyone is heading through The Gorge towards Idaho, let us know. So it looks like Debbie is still single. 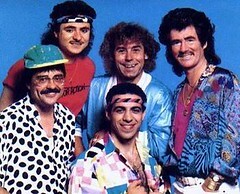 If any suitable bachelors are interested you can send us an email and we'll forward it to Debbie. Remeber when we left a bag with our video camera and some shirts in Memphis, TN? 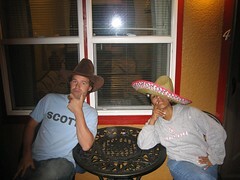 A few days later we were sent a ransom video from some very suspicious camera snatchers. Suddenly there was hope that we would see our camera again. All we had to do was meet their demands. Hopefully that should be enough to convince them to send us the camera. Those two guys seemed really intimidating. They even used their real names in the ransom video. We woke up this morning feeling pretty ready. But there was no way we could prepare for the caliber of awesomeness that we were in for. It was a rainy November Sunday in the Pacific Northwest. 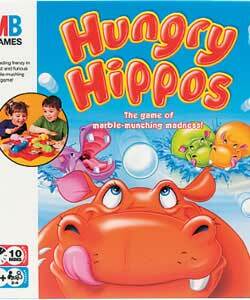 The type of day Scotty would typically spend playing Boggle or Hungry Hungry Hippos with a warm glass of milk. Unfortunately for Scotty we had to cover some serious ground today. Kaarin picked us up first thing in the morning; as far as we're concerned 10:30 is first thing in the morning. She drove us from Olympia, Washington down to meet Debbie in Lake Oswego, Oregon. Lucky for us Kaarin had some great stories, a contagious smile and a homemade CD titled "Girly Mix". We would be happy to ride with Kaarin any time. What made this ride even better is that we knew we would be crashing Debbie's coffee date. Debbie was out on a blind date she had arranged on the internet. Even with such an important commitment, she couldn't resist giving us a ride down to Salem. In fact, she told us to just meet her during the date and we'd go from there. Perfect. If there is one thing we go out of our way for it's awkward situations. I'm sure Bill was delighted to meet us. After that unique social engagement, we said goodbye to Kaarin (it wasn't easy) and headed south with Debbie. 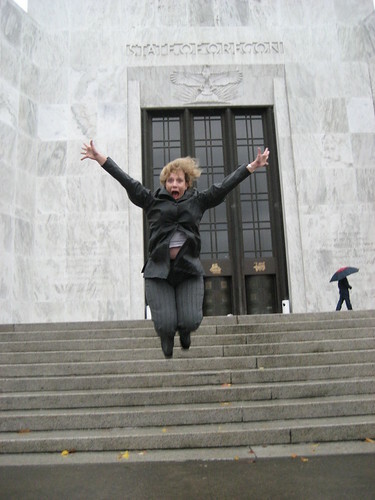 It wasn't long before we were on the steps of our 31st state capitol (Salem, Oregon) on our 27th day. But more importantly, it was Debbie's first jumpshot. More about Debbie's date and a lot more about the Salem state capitol visit coming later tonight. The grad ceremony was good. Well actually it was long and wet. But it was defiantly worth the trip to Victoria to see everyone and participate in the ceremony. 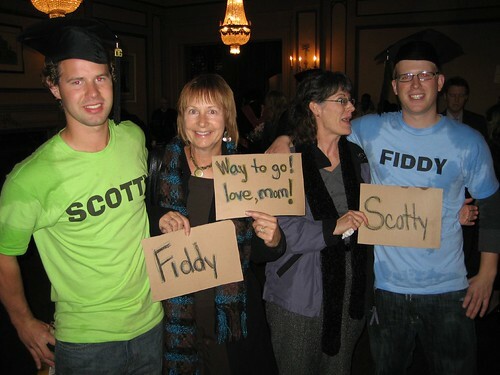 Highlights included seeing the funny costumes people wear for these ceremonies, Scotty’s diploma having a typo in his name, but most of all, making our moms proud. 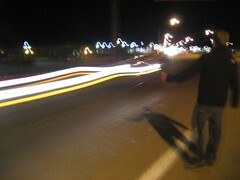 We met up with all our grad class and painted the town red, without the GPS. 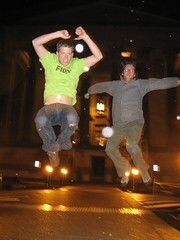 Our resident tech guy Heath even got in on some late night jump shots. Then Rez showed off his best ShakyFace while Teegan got her frown on with Scotty. Steve McKay, who is still looking for a job, gave us a place to stay in Victoria. He even made us breakfast. What a nice guy, if I was an employer I would definitely give him a job. This afternoon Steve took us down to the legislature building in Victoria. Not capitol building, it’s a legislature building in Canada. Here it donned on us that we had no business being in Canada, and needed to get back to the roads of America. After wasting precious time in Victoria Steve drove us up the road to the ferry terminal and donated two tickets to Vancouver, British Columbia. Waiting to pick us on the mainland was Gordon. Gordon is a young guy from Abbotsford, British Columbia. He recently graduated university, got married, earned a full time job and bought a house. Talk about growing up in a hurry. Just throw some kids and a dog in there and away goes your free time. Maybe that’s why he jumped on the idea of spending his Saturday night driving us down to Olympia, WA. Gordon works as a GIS map tech for a local municipality. Like many map enthusiasts out there he was intrigued by the GPS mapping on our site. Battling the monsoon-like rains, we passed through the border, beyond Seattle and into Olympia, WA. Capital number 30. Got some photos with Gordon, said goodbye and checked into a hotel. Heather the front-desk girl even did our laundry for free!